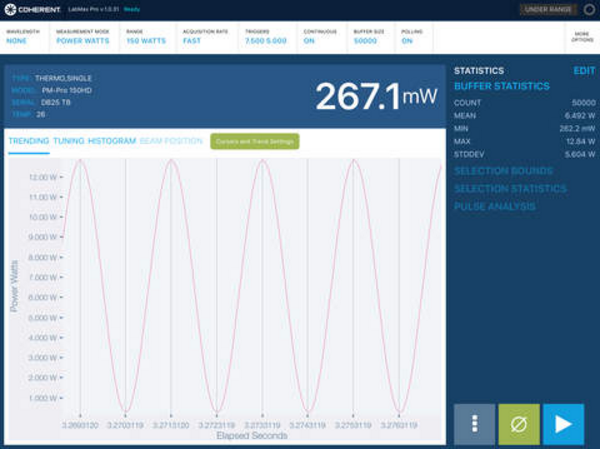 The new LabMax-Pro Mobile app enables wireless operation of laser power and energy sensors using an off-the-shelf mobile device. By leveraging the existing high quality, yet economical, touchscreen displays currently available on the market, Coherent can deliver a powerful and easy-to-use laser measurement solution at a reduced cost and in a more compact and portable form factor. In addition to this improved mobility, the LabMax-Pro Mobile App provides the ability to save and export data that can be sent to collegues and imported into the desktop application for more in-depth analysis and reporting. The app can be utilized with two different hardware configurations. 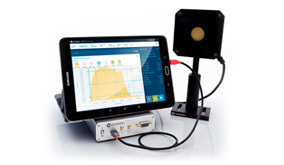 In the first, the tablet is connected by USB cable or WiFi to Coherent’s newest and flagship LabMax-Pro meter, which works with virtually all of Coherent’s extensive selection of laser power and energy sensors. LabMax-Pro meters are the fastest on the market (continuous sampling at 10 Hz or 20 kHz, or burst sampling at 625 kHz), and the app fully supports these high speed measurements to enable real-time analysis of modulated or pulsed systems. In the second configuration, the tablet is connected by USB cable or WiFi to one of Coherent’s new PowerMax-Pro USB sensors. These integrate the meter functionality within the sensor head cable, allowing a truly “meterless” tablet solution with PowerMax-Pro sensors. 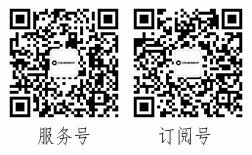 The Android app is compatible with mobile tablet devices running the Android operating system 5.1.0 or greater. Tablets that have been tested in R&D include the Samsung Galaxy Tab S2, Nexus 9, and Nexus 7. A screen size of 8” or greater is recommended to maximize the readability of the labels and trend chart, although the app will run on smaller devices if desired. The Apple app is compatible with the iPad mini and full size iPads. Mobile phones: The app will run on smaller devices, such as mobile phones, but the layout is not currently optimized for the small displays. Legibility of some features will be difficult when used on these small devices. X86 processor tablets: Tablets like the Dell Venue 10 that combine an x86 processor with Android OS 5.1.x are not stable enough to run the mobile application. These devices can hang up unexpectedly and are thus not recommended. Depending upon the type of tablet, there are several ways to connect the mobile app to the Coherent LabMax-Pro or PowerMax-Pro USB data stream. Apple Tablets: If the tablet is an Apple iPad, then the connection must be over WiFi. Apple does not allow direct USB connections. The WiFi connection can be a direct connection between the Coherent WiFi adapter and the tablet, or it can be through a local WiFi network by plugging the adapter into an Ethernet port. Android Tablets: If the mobile device is an Android tablet, then in addition to the two WiFi options, there is also the ability to connect through a direct USB cable. Coherent WiFi Module provides serial connectivity between the LabMax-Pro meter and Apple iPad or Android tablet devices via WiFi. The WiFi Module has been designed to work seamlessly with the Coherent LabMax-Pro Mobile application available from the Apple iTunes App store Google Play Store.